Happy Wednesday, crafty friends! I hope that the middle of the week finds you well! 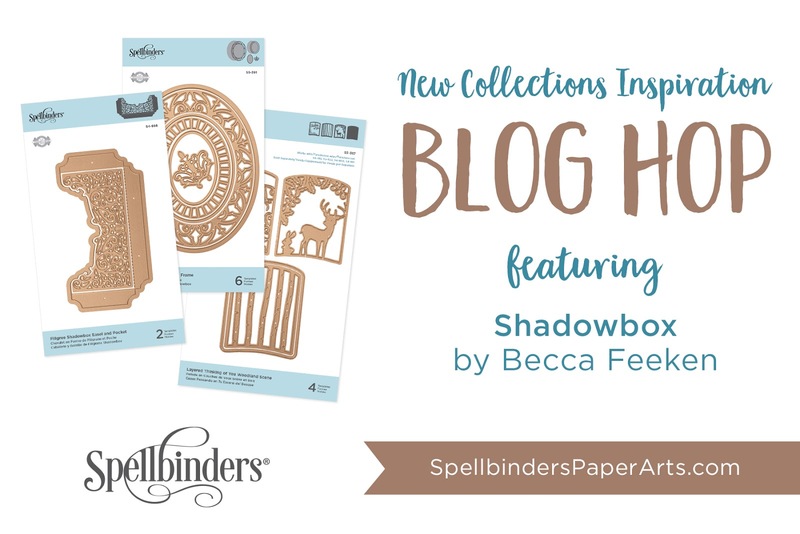 Today I am excited to be joining in on the Spellbinders Shadowbox Collection Blog Hop! You can find all the new Shadowbox products HERE. These dies are such a FUN concept, and can be used in so many ways! My friend Kathleen used them on a layout, framing her photos! I am using mine on a card, but they would make amazing tags, mini albums and home decor projects as well. I will put all the blog hop info at the bottom of my post, but how about we get to my card first? If you know anything about me, you know that I love woodland themed everything - it makes me think of my sweet Layton up in Heaven, and of my home state, Montana. So when I saw the Shapeabilities Layered Thinking of You Woodland Scene, I knew it was what I would use first! The Shadowbox dies come in three sizes, which determine the width of it, and I chose the Die D-Lites Adjustable Shadowbox Frame with 1/2" Border for my card today. To start, I created the shadowbox from a sheet of 12x12 paper from Alexandra Renke (This is from her Nordic Christmas collection, but is a neutral. It can be used for anything!). You can make them in any size you want, so I chose my typical 4 x 5 1/4 inches, which would be sightly framed by my A2 card base. For the 1/2" shadowbox, your paper strips need to be 2 1/8" wide, and then you need 2 strips cut to the length of each side. So (2) strips that are 4", and (2) strips that are 5 1/4". How do I know that the width needs to be 2 1/8"? Well - because they told me in the initial email - lol! But, if you actually measure the dies - that is exactly their width. As I mentioned above, my friend Kathleen created a layout with these dies and she also did a great video, showing how she put her frames together. 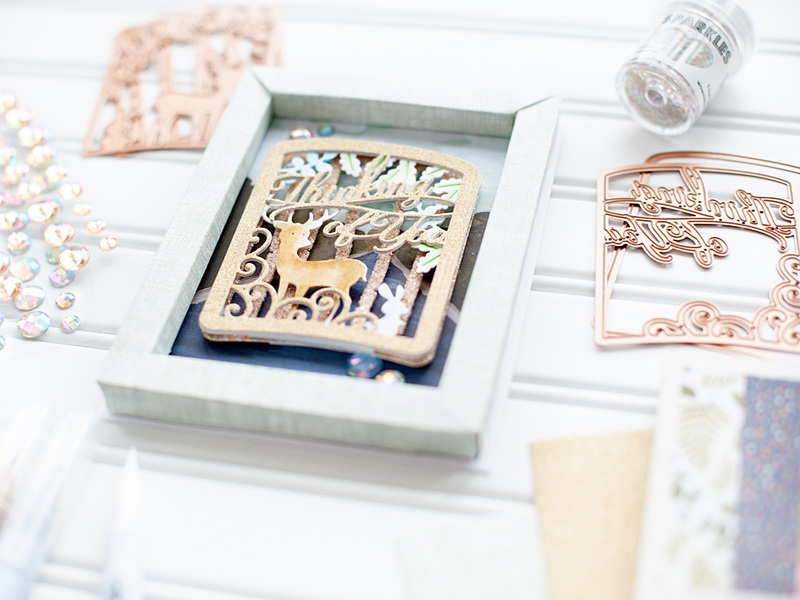 You can catch that video HERE - it is really helpful for watching the shadowbox come together. Once the shadowbox was assembled, I adhered it to the front of a white A2 card base, that I had already layered a block of patterned paper to. The paper is a beautiful river scene from the Creekside papers by 1Canoe2. I LOVE this paper, but was never really sure how to use it on a card. Framing it with the shadowbox was PERFECT! It perfectly compliments the woodland scene that I will be creating next. Next I diecut the Woodland layers. I started by diecutting them all from 130 LB cougar white cardstock, then cut the top Thinking of You layer again from MirriSparkle gold glittered paper. I covered the tree layer in WOW Sparkles - Your Carriage Awaits. Then I loosely colored the deer/bunny layer with Zig Clean Color Real Markers. Finally, I adhered the two Thinking of You layers together, with the gold on top. I glued the Thinking of You layer directly to the top of the animal layer, and then popped it up with Darice thin foam tape to the tree layer. Because the tree layer was glittered, I added mixed media adhesive to the foam tape so it would securely attach. With that finished, I layered it to the middle of the card with the same thin foam strips. Finally, I accented around the woodland diecuts with my signature iridescent jewels. Such a fun card to put together, don't you think? This will NOT fit into an envelope friends - you will have to mail it in a bubble envelope or attach it to a package/gift bag for best results. So, how about we get to all the blog hop info that you need? Happy hopping, and have a terrific rest of your Wednesday! Great card. This set has so many possibilities. I really like the woodland theme you used, I have many in my family that are outdoor lovers. I agree, so much you can do with these dies. Love the design! super project - love this new die!!! Gorgeous scene you've created! I can't wait to make one. Oh, this is so sweet! Love the layers, the different textures... the sponging looks great on the deer and sweet bunny. Beautiful and delicate. Nice to see a feminine outdoor scene. Beautiful shadow box project, Lea. Love the layered scene for the inside. What a great gift. Gorgeous project Lea..such a pretty take on the dies and the colors you chose are perfect. Fantastic use of the dies. The woodland scene is fantastic. This deer die is ONE of my faves as I just adore them. Your project is stunning. Your deer scene is just adorable. I need it. What a sweet tribute, I love the woodland die as well. Just gorgeous! TFS! Very nicely done, Lea! Love this new frame die! Love all the dimension in this woodland scene. Beautiful shadowbox! I love the way that you used it to frame the multidimensional woodland scene. Love your project — those dies give such a finished look. 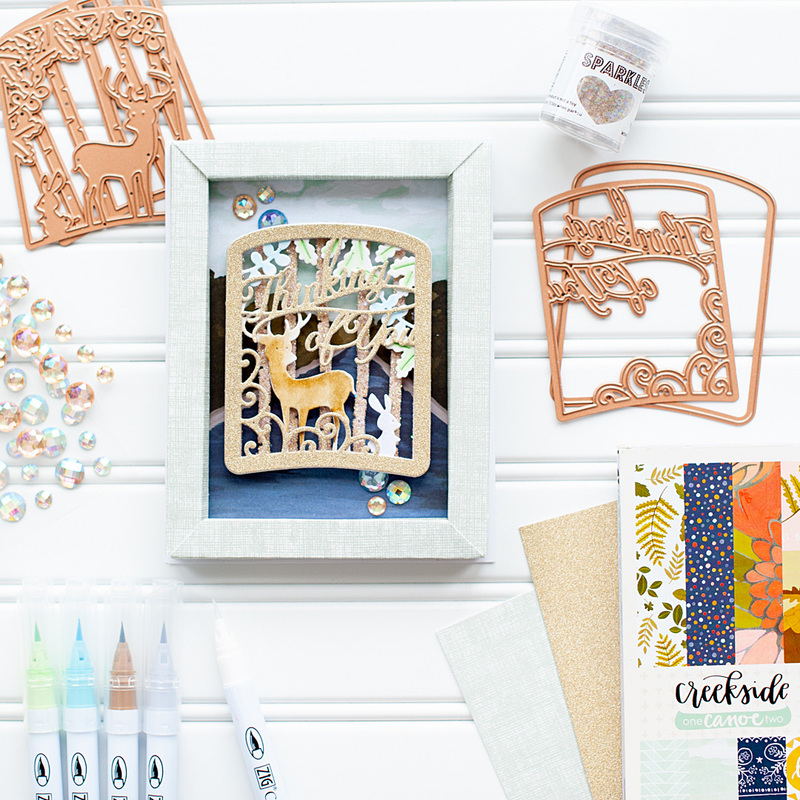 What is better than a woodland scene for those of us who love the outdoors! A special shadowbox card it is! Great project for a guy! What a neato die set. I just watched Becca's video on putting this shadowbox together. I have all kinds of ideas! What a great masculine version, hanks for sharing your version! This card came together beautifully and the ability to customise the size makes it a fab option for home decor pieces. Cards for guys are always a challenge. I think the Woodland Scene die is a perfect. Hand coloring the layers made it especially gorgeous. Lea, love the 3 dimensional piece of this frame. As always, your project is unique and beautiful Love seeing your art. I love the dimensional scene you made here. What a great little story shadowbox you built. The woodland theme and its sparkle and glitter are wonderful. It would be a real gift for anyone! Thank you for sharing with all of us. This is so sweet and beautiful, Lea!!! Love the little deer scene. These shadow boxes are fabulous. The woodlands scene looks very nice. I'm always looking for masculine themes. I'll have to consider this one. I really like your creative background! 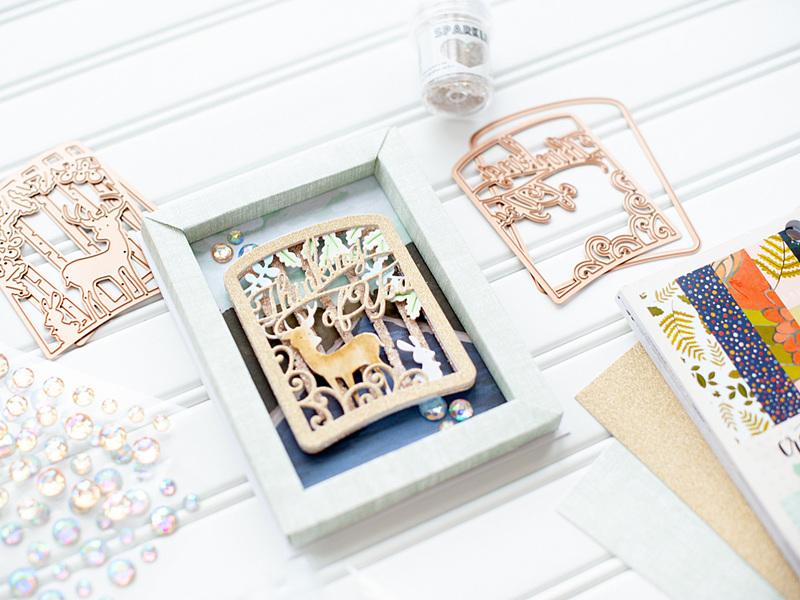 What a gorgeous set of dies - I love that little deer. 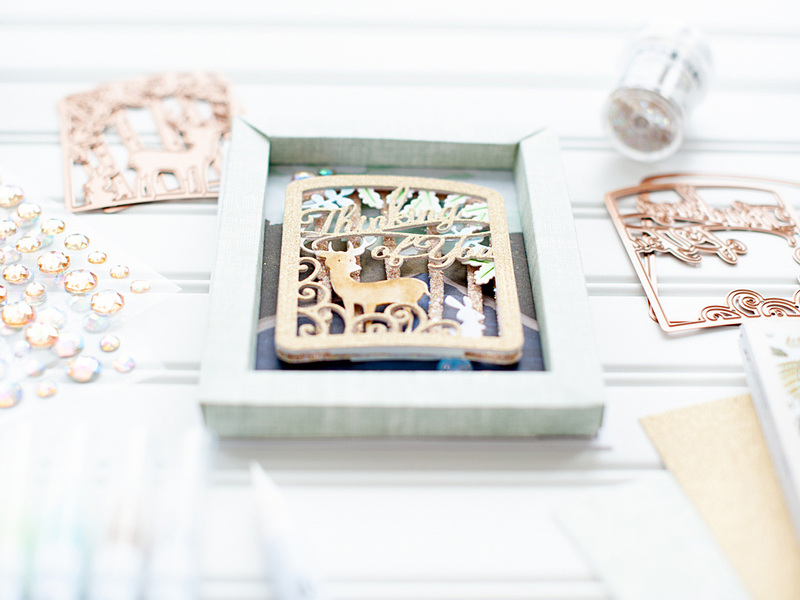 Very cute deer shadowbox. Lea, what a sweet and adorable project! I absolutely love the dimension and how you've colored it!! Cute, cute, cute!! This is really a great card. It would be so perfect for my man card ideas since I really lack the inspiration for those. Thank You for sharing your imgination with us today. Such a lovely card! I love trees and your project makes me super happy! Really liked the reindeer card. What a great card for men. Love seeing more men cards. Thanks for sharing your card for the blog hop for the new Becca Feeken Shadowbox dies. I liked seeing the reindeer example and how it can be used as a "thinkg of you" card. It will be especially useful for these winter months to remember people we don't see often enough! Thanks for sharing a lovely card. Love what you did with these dies! They are truly amazing! What a fabulous woodland scene! Such a beautiful project with so many amazing details. 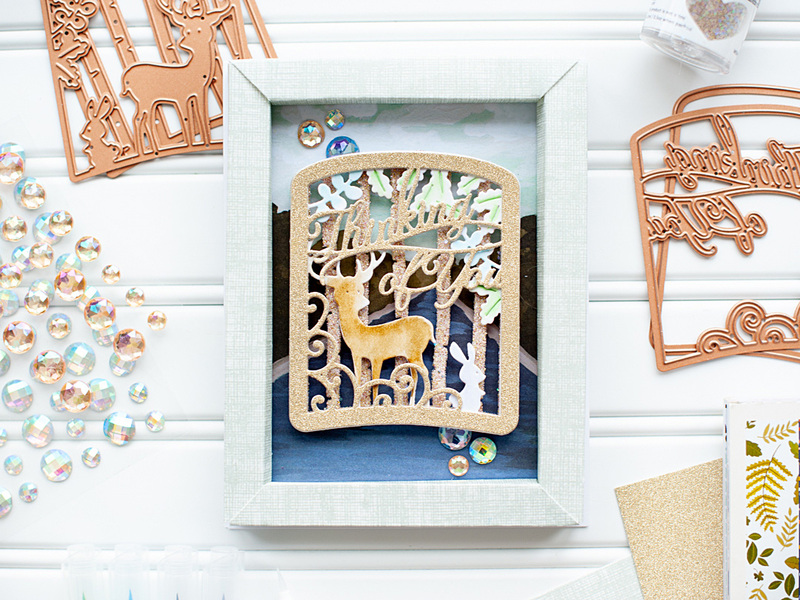 Your deer and that cute bunny are adorable and displayed with style in these amazing Shadowbox frame dies! I can see doing this with the other vignettes scenes as well! TFS! 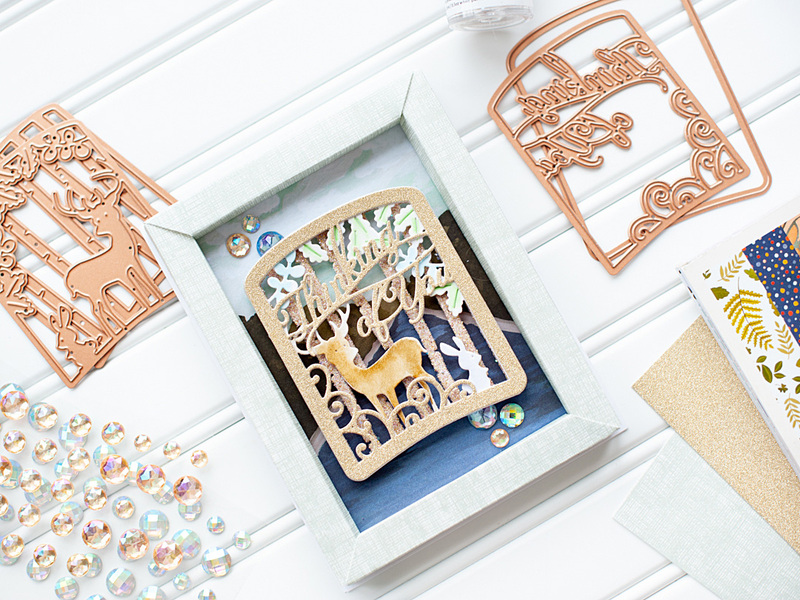 This new Woodland scene is so perfect with so many of the 3D vignettes by Becca!! Love the framed inspiration and have to have all of these newest releases! Beautiful project. Love the woodland scene. I love your project! Beautiful! Wonderful, unique shadowbox. Love these dies. Super cute! Thank you for sharing!!! Such beautiful details! Love your shadowbox project! So pretty! 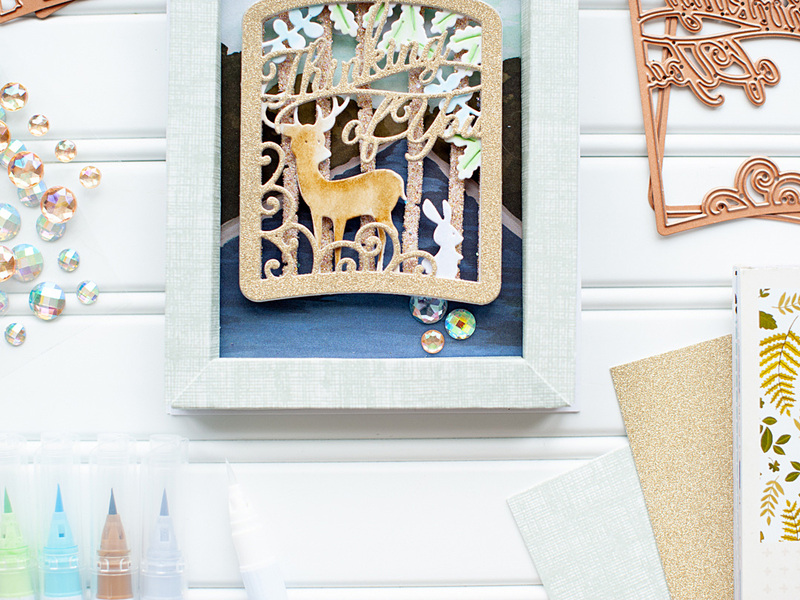 Love the colors and the beautiful shadowbox frame you created. Oooh, this is so beautiful! I really like your framed image with the deer. Thank you for sharing your inspiration! 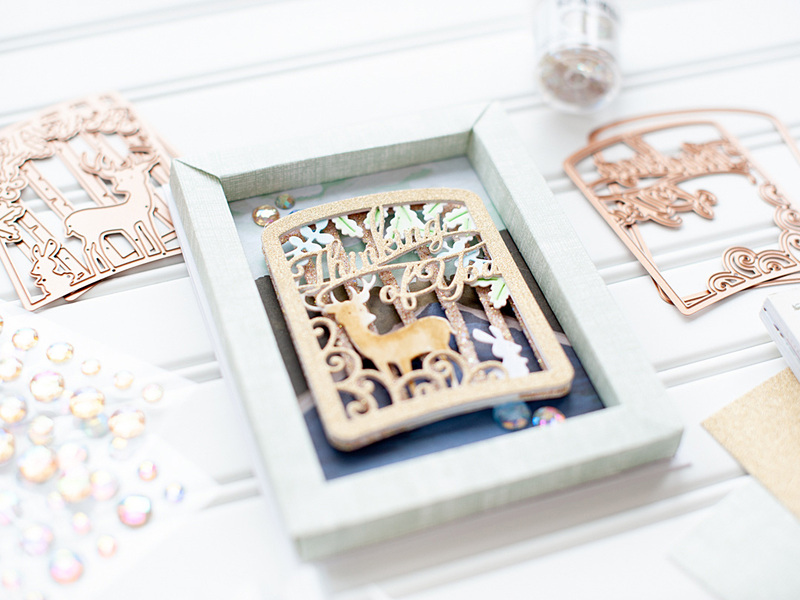 Adding the vignette dies to the shadow box dies was a great way to show how Becca Feeken's dies all work together. Your project is amazing. I ma just loving all of these projects! Love all of the inspiration in this blog hop.